Mike and Mary Grulli met in Naples, Italy in 1992 and married on the Isle of Capri in 1998 - the ultimate Italian Love Story. A graduate of the Naval Academy Class of 1968 and a former Naval Flight Officer, Topgun graduate and Vietnam veteran, Mike retired from the Navy in 1994. Mary is a retired Reserve Air Force Medical Services Officer who worked as a buyer for Kmart and in several capacities for the Navy Exchange System. Mary and Mike have spent many years in Italy studying wines and refining their skills at pairing Italian food and wines. Their mutual appreciation and passion for Italian wine and food led to the creation of VINOTTIMO ("Great Wine") in 1995. Today, VINOTTIMO LLC represents both New World and Old World wineries on overseas military bases throughout Europe and Asia. Mike and Mary spend their time as traveling wine ambassadors hosting Vintner "bottle signings", wine shows, dinners and wine tasting classes throughout the world. In between their travels and bicycle riding, they can be found cooking and tasting wines at Villa Maria located in Reno, Nevada. 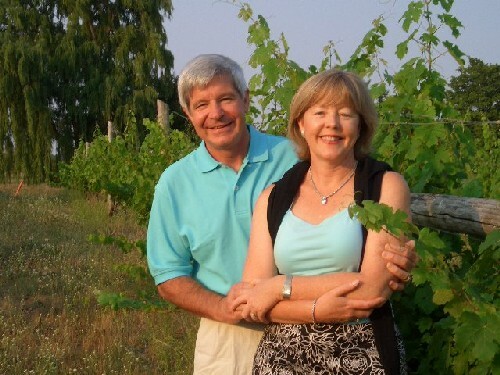 Mike and Mary's infectious enthusiasm for Italian wines makes their wine tastings unforgettable, fun-filled events. Anyone who has attended a "VINOTTIMO" wine tasting leaves with a lifelong appreciation for the grape. Mike and Mary take the mystery and intimidation out of wine and turn each tasting event into an amazing adventure for all of the senses.